Sometimes, my friends, bacon just has to happen. 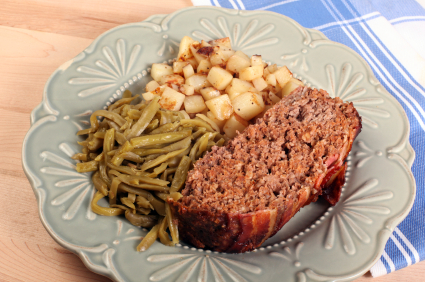 While many people bemoan just how bland meatloaf is, for me it is a comfort food from my childhood. Still, I’m all for jazzing up even the classics, and this bacon-wrapped meatloaf does it in spades, with smoky bacon and a sweet, tangy sauce. So the next time you’re looking for a little classic comfort food, give this baby a try. Serve it with some smashed taters and a side of roasted veggies. Heat oil in a saute pan and cook onion until transparent, about four minutes. While onion and garlic cools, combine milk and bread crumbs in a dish and stir well. Set aside. In a large bowl, combine beef, pork, veal, salt, pepper, eggs, bread crumb/milk mixture, cooled onions and garlic, thyme, Worcestershire sauce, Dijon, garlic powder, hot sauce, and onion powder. Stir (I use my hands) until all ingredients are extremely well combined. Turn out mixture onto a rimmed baking sheet (line it with foil to make clean-up easier) and form a free-form loaf. In a small saucepan, heat ketchup, vinegar, sriracha and brown sugar until sugar dissolves. Spread half the sauce over the loaf. Return the remaining sauce to heat and allow to boil before removing it from heat. Arrange thin sliced bacon in a single layer to coat the entire loaf. Bake in a 350 degree oven until internal temperature reaches 160 degrees, about 60 minutes. Remove meatloaf from oven and allow to rest for 20 minutes, tented with foil.